Glanton was so frustrated with how the Owl's had been performing late in games, that he started a scuffle with a teammate in practice last week that had to be broken up an assistant coach. When asked at the time if it was something personal, Glanton stated that was nothing to read into, but on Saturday it appeared that attitude resurfaced. The linebacker was all over the field in the first half and helped hold UAB to just 51 yards rushing – which was the lowest total by an opponent in 25 games. "He's that guy in our defense who plays behind the double team and has to be very athletic and a player maker and a good tackler… he just keeps getting better and better," Carl Pelini said on Monday. 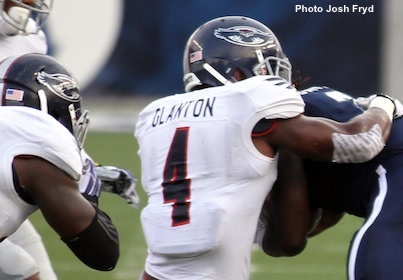 Glanton has registered a team-leading 48 tackles on the year, which ranks sixth in Conference-USA. His 2.5 sacks this season are the second most by a C-USA linebacker. On paper the Owl’s played one of their most sound defensive games of the season, but according to Pelini there is still room for improvement. “We have a lot of mistakes to clean up… In terms of the effort and pursuit we set a new standard on Saturday that would be hard pressed to match for us or anyone to match,” Pelini said. Marshall quarterback Rakeem Cato isn’t far behind FAU’s Jaquez Johnson when it comes to rushing statistics this season, but that doesn't have the defense concerned. Defensive back Josh Orsino stated on Monday that the league’s Preseason Offensive Player of the Year isn’t much of a dual-threat. “They love to pass, they definitely pass a majority of the time. The (quarterback) is very good, he’s not very fast. If we play our game, our secondary just steps up, then we should be good,” Orsino said. Cato has run for three touchdowns this season and accounted for 46 yards on the ground in a triple-overtime loss to one of the nation’s best defenses in Virginia Tech. As with most teams at this stage of the season, FAU is dealing with a large number of injuries. Cornerback Keith Reaser underwent an MRI on Monday, and Pelini mentioned that his status remains unclear. Safety Jeremy McKnight, who missed the UAB game, is expected to be back in the lineup against Marshall. Defensive Trey Hendrickson is battling an ankle injury.